I just took a piece 5 1/2″ square of white card stock and using the score it with the Diagonal plate. Score the top at 1″ (corner), 2″, and 4″ down the side at 2″ and 4″. Turn your card stock once and score top at 1″(corner), 2″ and 4″ down side at 2″ and 4″. Make a pattern where you will have a v shape cutout. 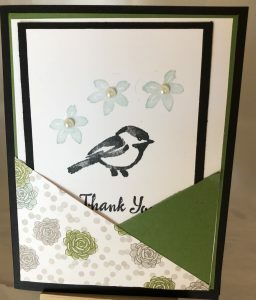 Place your pattern v at a v on your cardstock and using a sponge with your color of choice and sponge just above your v in a circular motion starting on your pattern and working up a small portion of your card stock. Do this sponging on all connections of v’s.